Pineapple, lime and a bit of ginger make for a refreshing juice brimming with tropical flavors. 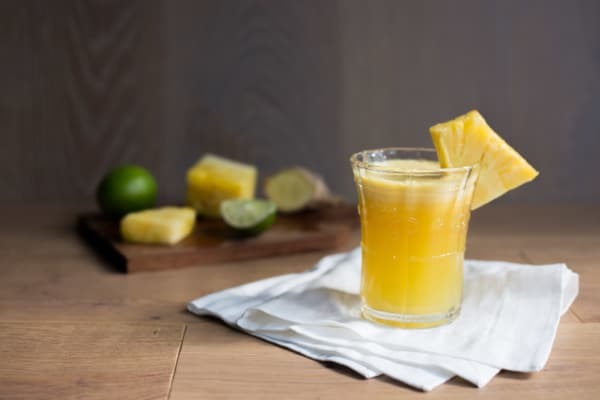 Pineapple is an excellent source of vitamins b and C, manganese and iron, while ginger does wonders for your digestion and adds a spicy warmth to this tasty beverage. A squeeze of lime juice adds more vitamins and minerals and saves the juice from being too sweet. Using a high-speed juicer extracts the maximum amount of nutrients from the fruit. This invigorating recipe would make for an energizing and light breakfast, or restorative post-workout snack. Add a shot of tequila and a splash of Cointreau for the ultimate pineapple margarita. You could even make margaritas for a crowd by quadrupling the ingredients and adding to a pitcher. Garnish with fresh lime slices and pineapple wedges for a delicious and beautiful cocktail! Per Serving: 51 calories; 0g fat; 12.9g carbohydrates; 1g protein; 0mg cholesterol; 2mg sodium. This juice feels refreshing and cleansing. It's great on its own, but as the tip states, I did add a splash of tequila to the mix for a margarita-esque feel. If you have some leftover pineapple, freeze it an throw it into the drink for "ice cubes" and to enjoy later with the soaked up tequila. I didn't add tequila, but I DID add a bit more ginger and loved it! Delicious!